There are a few misconceptions around Scotch whisky that I still hear today. First, I often hear how scotch is ‘smoky’ with strong iodine notes, and therefore a big turn-off for whisky drinkers. In truth, most scotch sold contains very little in terms of smoky notes. The second misconceptions is, only Islay distilleries make peated whiskies. In truth, peat was a main fuel source up until the 1950s in many parts of Scotland and was commonly used in the whisky making process. Being a natural fuel source, the heat from burning peat was used to dry barley, and in the process it smoked the grain. The smoky notes survived all the way to bottling. I should note, though, it’s not quite that simple. Today’s peated whiskies often have a slower fermentation process to help contain these levels of peat. In the early days of scotch, most scotch was peated. Today, most peated distilleries are located in Islay (though not all Islay distilleries are heavily peated) and scotch outside of Islay can be made with peated barley. Almost all scotch has some levels of peat, but often too low to detect. At any rate! Since 2001, Balvenie has returned to their roots by making a peated whisky for one week each year. They call this period of time “Peat Week.” The legendary David Stewart is behind this idea. While this was known, whisky fans had a bare taste of this peated whisky. 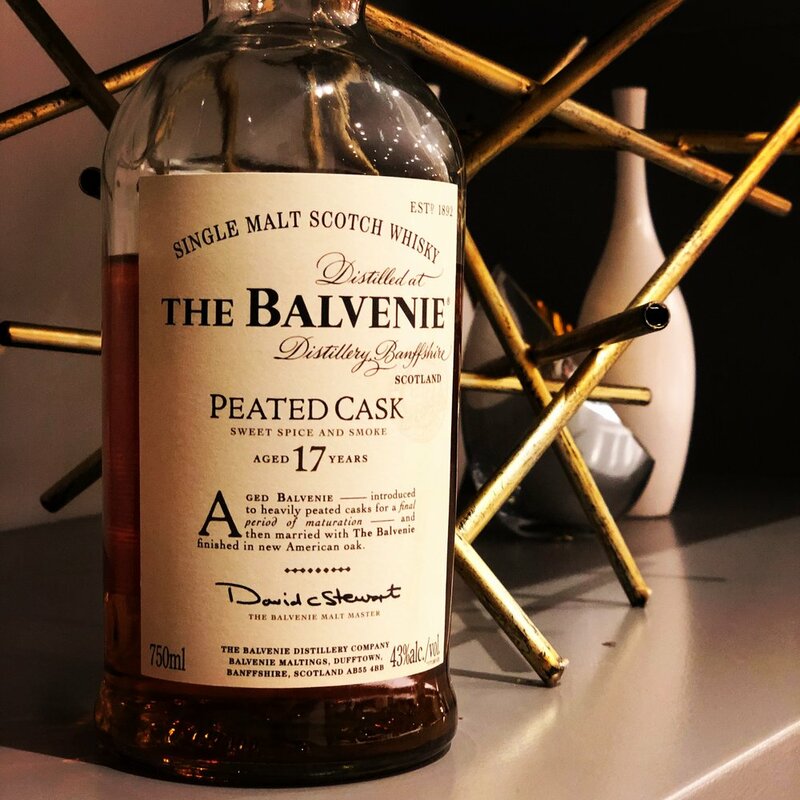 In fact, it wasn’t until 2012 that Balvenie released a limited run 17 Year Old scotch that was finished in barrels that previously contained peated whisky. It was a delicious pour with a unique sensation of having palate forward peat notes (all the smoke was on the palate, less so on the nose). Well, it looks like Balvenie is ready to push that peated envelope! Two releases have been out since summer. The first is affectionately named “Peat Week” and it’s a fourteen year old American oak aged peated whisky. This is a limited run. The second, Peated Triple Cask, is intended as a global travel retail release. That’s great news for whisky drinkers, because Balvenie has the habit of turning successful travel retail whiskies into regular expressions. The biggest complaint with these peated releases is it’s not “peated enough.” That’s fair, but Balvenie has never suggested it’s making big bold peated whiskies. Let’s not get in over our heads with this; they’re not competing with Laphroaig and Ardbeg as a peat monster. Quite the opposite, Balvenie seems to be making converts with a new direction for peated scotch. Balvenie uses only Highland peat. It’s a more earthy, smouldering campfire type peat. It lacks the medicinal iodine notes commonly found in Islay peats. The variation of peat from common heavy iodine notes is refreshing (and I love my heavy peated whiskies!). Peated Balvenie whisky matured in first-fill American oak, refill American bourbon barrels, and sherry casks. This play on barrels is right in David Stewart’s wheelhouse. Nose: Caramel and char. Like caramel dripping off a branch right unto a smouldering fire. It’s intense. The honey notes come through. Sure, Highland peat is gentler, maybe, but not as apparent here. This is campfire smoke. Palate: Caramel notes continue through heavily from start to finish, with plenty of spice. It’s not unlike a fire in your mouth, with lots of dried figs, creaminess, and warm. Lots of great textures on the palate. It’s a rare pour of whisky. The combination of heavy wood influences and peat are not a balancing act in this bottle—it’s more of a fireworks show! It’s explosions of flavour at every level. It’s the creaminess that really binds this whisky together. Without it, it would be a flop. With it, it’s a hit. It’s a type of flavour that’s rare in peated whiskies. Beautiful pour. Peat Week is a one-time collectors release that’s been aged exclusively in American oak barrels for fourteen years. It’s the opposite of Peated Triple Cask, with far softer notes of peat. This peated expression is a better example of the Highland peat where the gentler earthy notes make room for the barrels to stand-out. Nose: Beautiful vanilla and candy lime notes. Really beautiful citrus notes. Great pastry. Freshly cut apple pie. Hints of cinnamon. My peat detector does not go off (it’s not overly sensitive). Rich buttery sweet. This isn’t a gentle pour. It’s intense. Brash. And yet, so damn smooth (and I don’t mean in the smooth whisky sort of way, I mean in the “smooth criminal” sort of way). The peat notes are gentle, but present, on the palate. Lots of tangy notes that come through wonderfully. Disclaimer: While I had tasted Triple Barrel independently, I was also provided with sample bottles of these two whiskies.